Nobody can guarantee a best place to put Google AdSense in your post, The traffic and article content are much more important. Our Google AdSense normally put the left top in a single post. However, today we read Google AdSense performance report and found “OPTIMIZATION TIPS Best practices for ad placement”, the good layout and bad layout. Most recent Google AdSense often provides performance report about your website, there are some new concepts but the main seems Scorecard. Your scorecard provides you with a summary of how well your ad settings, webpages and content are performing compared to those of other AdSense publishers. The scorecard is organized into different categories, such as revenue optimization and site health, with each category scored on a scale of one to five blue dots indicating your performance. You can further understand your performance and the steps you can take to improve it by following the suggestions and improvement tips in each category. Mobile Platform is more and more important and popular. So we can not only consider traditional platforms for our Google AdSense. The best solution is that let AdSense be able to display on both of Desktop and Mobile platforms. There were some people had their solutions, or made some plugins. Actually, we do not need to do extra works, Google has considered it for us. We just use the AdSense scripts directly. 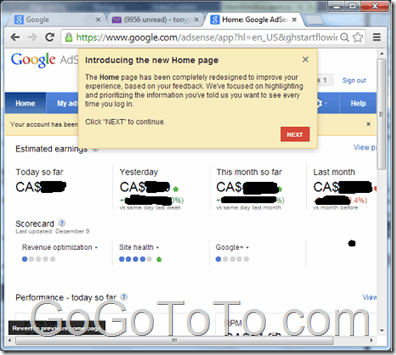 Google AdSense has changed several time, this time they changed again. The Home page has been completely redesigned to improve your experience, based on your feedback. We’ve focused on highlighting and prioritizing the information you’ve told us you want to see every time you log in. New gear icon: To align your experience with other Google products, we’ve moved the items in the left navigation bar into a gear icon in the upper right corner of the page.